This page will be updated with our latest survival medical classes and training show schedule. Be sure to read below for our course descriptions. 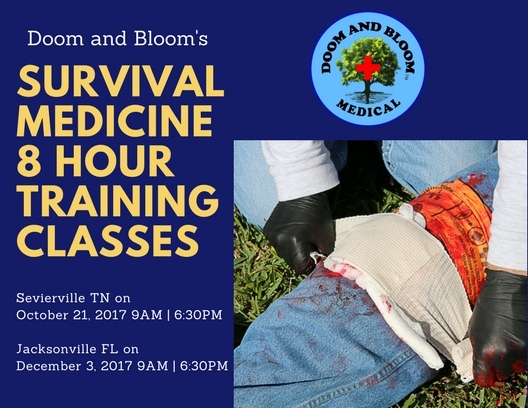 In addition to the many free lectures we give, we offer several different paid hands-on courses in survival medicine including suture/stapling classes and our NEW Medical Training Classes. Feel free to visit our booth at the events we’re attending, we would love to meet folks and answer any questions you might have!! If you have an event you would like to invite us to attend, please contact us at Drbonesclass@aol.com. Thanks! 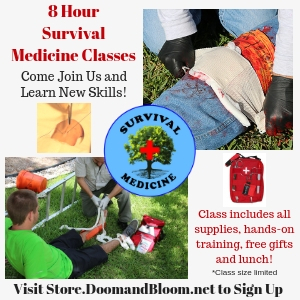 Learn how to provide complete wound care with hands-on suture training, as well as stapling with Dr. Bones and Nurse Amy, medical preparedness experts from DoomandBloom.Net. 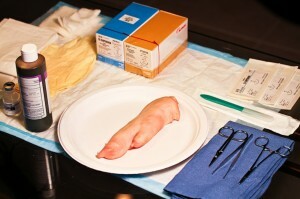 Using a pig’s foot, they’ll show you how to assess a wound, apply antiseptic, insert the sutures, tie a proper instrument knot, cut the extra sutures and learn how to space the sutures for proper wound closure. Also, know how & when to use staples and, most importantly, learn when NOT to close a wound. Wound care is also discussed in detail! This course is designed for the non-medical professional and those medical personnel without suturing knowledge. Sign up early as seating is limited per class. All Complete Wound Care with Suture/stapling classes are available for private instruction in your facility with a minimum of 30 students, plus other expenses, depending on the location in the U.S. contact us at dr bones podcast at aol dot com. Includes: 1 pig’s foot, 4 instrument suture kit (you keep the instruments), nitrile gloves, two 3-0 nylon or 3-0 silk sutures (you keep one sterile unopened suture), and betadine wipes. Plus: A special laminated suturing instruction sheet to take home. NEW SPECIAL Gift: Complete Wound Care Suture/Staple DVD which includes all slides shown during the class ($30 value). 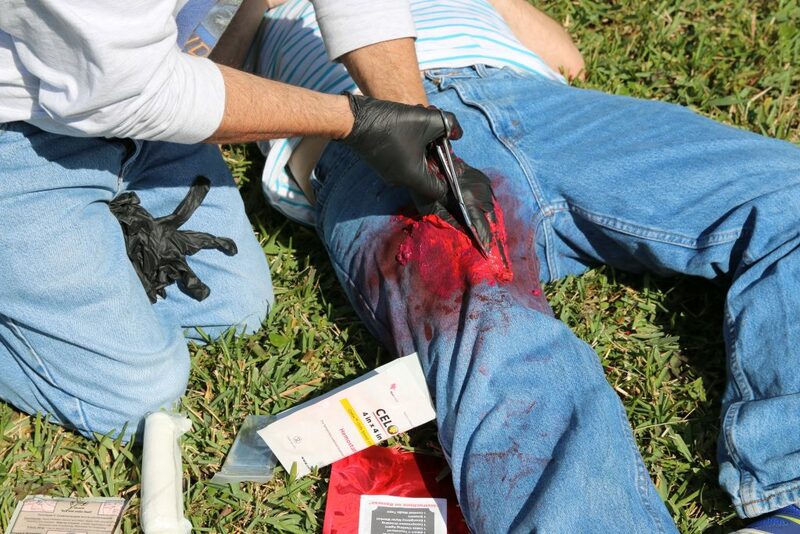 The Bleeding Control Class is meant to teach the non-medical professional basic and advanced concepts to control hemorrhaging in the injured victim. Different types and areas of wounds will be reviewed, along with some anatomy and physiology related to bleeding and injuries. A special Waterproof Bleeding Control Instruction sheet and 1 Israeli Emergency Dressing, will be provided to each student as free gifts. This course is designed to impart medical training class education (combined with some hands-on skills) to non-medical professionals. The class is about 8 hours long. Drinks, snacks and lunch is included. The Advanced 8 hour Medical Survival classes are available for private instruction in your facility with a minimum of 25-30 students, plus other expenses, depending on the location in the U.S., contact us at dr bones podcast at aol dot com.